Sprint's new 5G cities are New York, Kansas City, and Phoenix. They join the previously announced markets of Chicago, Dallas, Los Angeles, Atlanta, Houston, and Washington DC. Sprint says the newly announced markets will get their first taste of Sprint 5G service (which it calls Massive MIMO) in the first half of 2019. More Sprint 5G markets will be announced later, but the timeline may change if the T-Mobile deal goes through. Sprint has a ton of 2.5GHz spectrum that it's planning to use for 5G, but T-Mobile has the low-frequency spectrum needed to fill in the gaps. The two claim a combined carrier would be able to roll out nationwide 5G service faster. AUSTIN, Texas, May 15, 2018 /PRNewswire/ -- Sprint (NYSE: S) 5G will be making its way to even more major cities when it launches in the first half of 2019. 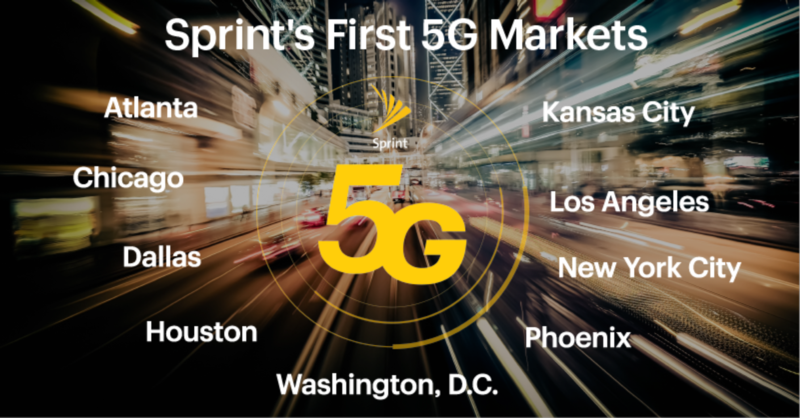 Among the newly added markets to be the first to experience Sprint’s fifth-generation network are the largest U.S. market, New York City; Arizona’s largest city, Phoenix; and its hometown of Kansas City.